In today’s complex world, people are demanding more control and access to information. Homebuyers and sellers find that the more knowledge they gain about the real estate market, the more able they are to make smart and confident decisions. 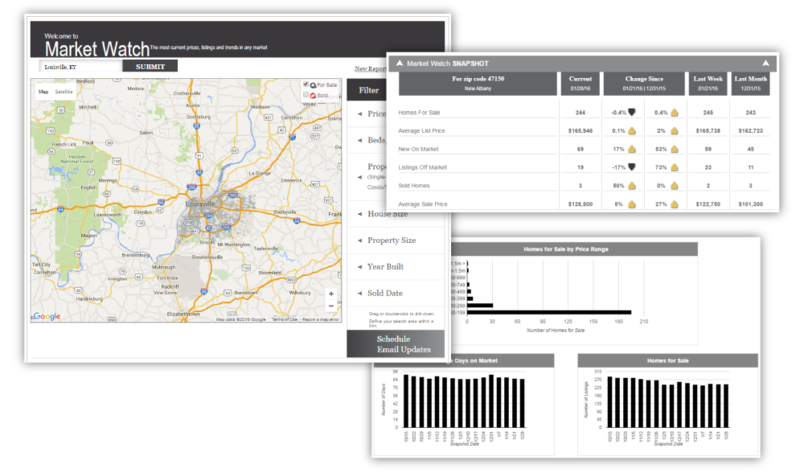 Our Market Watch system utilizes MLS data to provide detailed listing and neighborhood sales trends. With the convenient Market Watch report, buyers, sellers and investors are provided with ‘timely market intelligence’ for home, neighborhood and regional sales trends. Simply enter an address, neighborhood or city and get an instant snap-shot of market activity in that area. By having access to current listings, prices, recently sold homes, and trends you can see how a current property or area of interest compare to today’s market. In addition, you can sign up to receive automated e-mail updates of your Market Watch report to consistently stay connected with what is going on in your desired area.